There is a problem I addressed from time to time with updating software on Ubuntu. Or the non-existent updates. Like having emacs 24 when emacs 25 is out for month. Now fear no more if it comes to having the latest and greatest KDE on your machine. KDE neon is here to solve that problem based on the Ubuntu LTS version but having always the newest version of KDE. A great idea. To be honest, I would prefer this over Kubuntu anytime. The problem with Kubuntu is the same. It lacks updates. I think the KDE team was really frustrated on pushing out a modern and great system, only to see it takes ages (until they have another even better version) to get it to the people. However KDE says it's not a "distro". That's technically true. The distribution is Ubuntu 16.04LTS paired with a "package archive with the latest KDE software". But KDE neon is distributed in a separate image, ready to install or run as a live system from that image. So you could also say it's a distro, it's "KDE neon" in the end. I'll check on later if it's possible, without any negative side effects, to transform a Kubuntu version to KDE neon by removing the Ubuntu KDE repositories and adding the package archive from KDE muon. 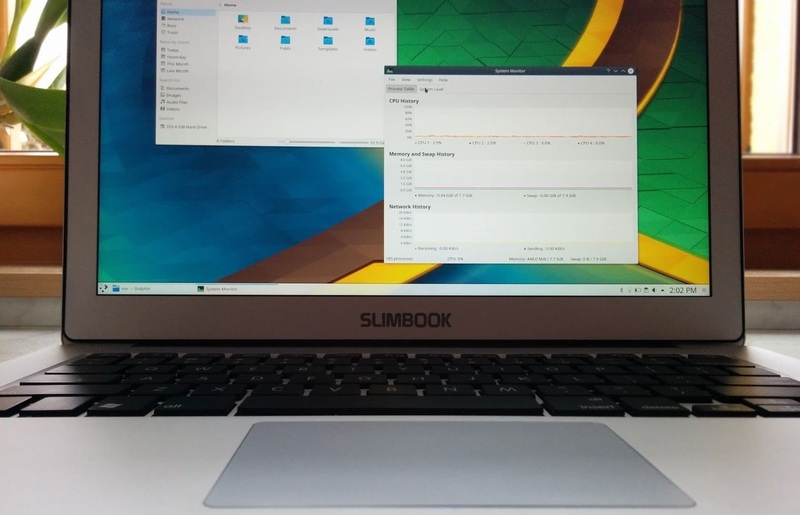 Photo from kde.slimboo.es. All rights reserved. It's a long missed move to bring more dedicated hardware devices that comes with a fully functional GNU+Linux System. The price ranges from €729.- for the smallest system which are a great start, to €1268.- for the best available version with all expansions. While the entry price seems a bit high, keep in mind that this is not a cheap netbook, but a full-fledged, high quality device that comes perfectly trimmed to use KDE Neon (and soon more GNU+Linux systems to choose).